I’m not alone in my fascination with the big ol’ fuzzy lug. Before the discovery of the dinosaurs, Megatherium was one of the biggest fossil celebrities. Even now, the bones of the immense sloth remain a fixture of many natural history museums, and, though not nearly as famous as Tyrannosaurus or Triceratops, Megatherium ranks pretty high on the scale of fossil mammal fame. Yet Megatherium was just one of many prehistoric species commonly known as ground sloths. In fact, paleontologists are still discovering new varieties of the group, and one of the latest to be discovered has just been named in a Journal of Vertebrate Paleontology paper by paleontologists François Pujos, Gerardo De Iuliis, and Bernardino Quispe. 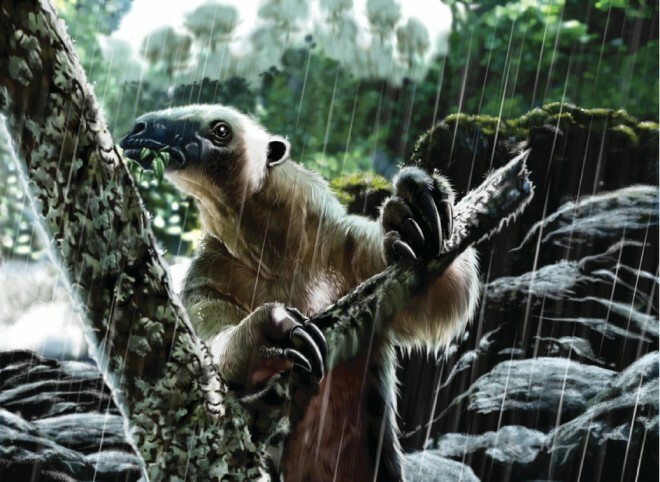 Hiskatherium was relatively small – in the native Bolivian language of Aimara, “hiska” translates to “dwarf.” Though more closely related to the extinct, and often large, ground sloths than to modern, arboreal sloths, the preserved toothrow of Hiskatherium only measured about 1.2 inches. Even if totally complete, the lower jaw would have fit comfortably in the palm of your hand. Frustratingly, though, investigating the paleobiology of the newly-described sloth is difficult on the basis of such incomplete materials. Pujos and co-authors therefore draw inferences about Hiskatherium habits from its tooth shape and other known fossil sloths. Hiskatherium had high-crowned, peg-like molars which, the researchers suggest, would have allowed them to chew through tough foods when necessary. Perhaps, like the much larger Megatherium, the smaller Hiskatherium was a selective feeder which preferred to crop juicy leaves from plants when possible but was able to “fall back” on less nutritious fodder during lean times. These hypotheses are based upon similarities between Hiskatherium and previously-studied sloths, though, and we will require much more complete remains of the small sloths to better understand its natural history. Top Image: A hypothetical restoration of Hiskatherium by Jorge Gonzalez. From Pujos et al., 2011.